Hi, I’m Jonathan, the Lead Pastor here at New Hope. I’m from Memphis, TN, but have lived in Queens since January 2018. My wife and I moved to Queens because we love the diversity of cultures and people, and all the good food. We believe Queens is a beautiful picture of what heaven will look like with people from every nation worshipping our Savior, Jesus Christ. That is what excites me about New Hope the most, a group of people from all different backgrounds coming together to worship Jesus and love one another authentically. My wife and I have 3 kids: Samuel, Levi and Ella. They are full of energy and bring so much joy to our lives. For fun as a family, we love to explore this great city and play at the park. For fun personally, I enjoy running and cycling, and reading a good book while sipping on some coffee. 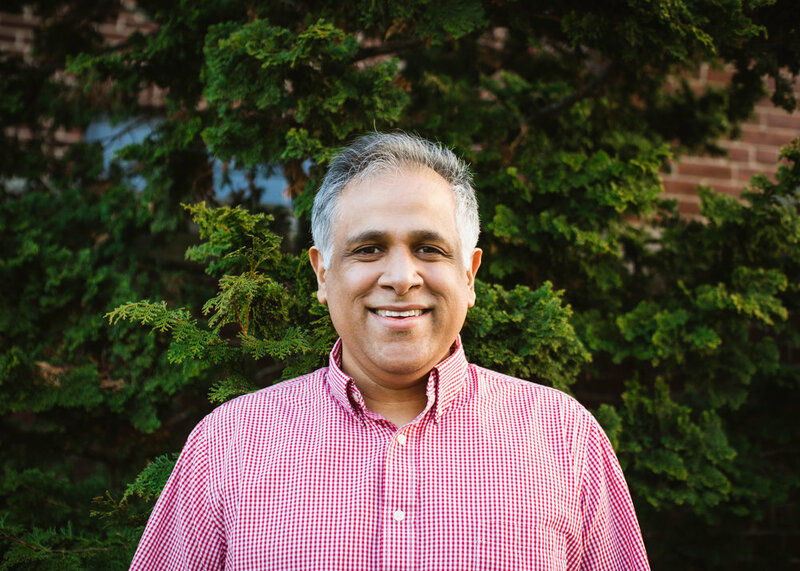 Hey, my name is Ajay I have been Associate Pastor of New Hope since 2000 and a member since 1995. I love being at New Hope because I love the opportunity to display hospitality to those in our community on a weekly basis. My wife Loukia and I have 2 kids, Sophia and Lucas. I am originally from India and my wife is Greek. I grew up Hindu and came to faith in Jesus as a teen, in India. I came to the U.S. in 1991 as an International student. I enjoy stamp collecting. Hey! My name is Andy and I’m an Associate Pastor here at New Hope. I live in Kew Gardens with my wife, Karen. I grew up in NY and Jesus graciously changed my life when I came to faith in college. I love helping folks see how the gospel can transform anything in our crazy world, from the personal to the systemic, and I’m passionate about helping people find their way in who God designed them to be. I’m a long-suffering Knicks and Mets fan, an ongoing struggle which has grown my faith in tremendous ways. What’s up! My name is Charles and I’m the Worship Director here at New Hope. I’m a New York native, born and raised in Brooklyn before moving to Jamaica, Queens while attending Brooklyn High School of the Arts. During my high school career I developed a love for music, and gave my life to Jesus. In 2012, I felt the Lord’s call to multicultural and urban youth ministry and soon after went on staff for Young Life in Jamaica, Queens where I serve in urban youth ministry today. I also currently work as a singer for an entertainment company in Manhattan, where I’ve been able to sing backup for artists such as Justin Timberlake, Brandy, and Jennifer Hudson. Hey guys! I’m Brittany, the Kids Director at New Hope. Born and raised in small town, Alabama, I graduated from Judson College with a B.A. in both Music and English, and I’m currently pursuing a Masters in Divinity from Southeastern Seminary. When I moved to NYC in 2015 to work with immigrants in Jackson Heights, New Hope was the first of what I thought would be several visits to different churches. I found New Hope to be such a special community that I never went anywhere else! I’ve enjoyed working with kids since I was about 8 years old, so it seems fitting that God would have me here. Some things I enjoy are traveling, living in a diverse setting, live music, getting to know people, good coffee, and cheesy jokes. Hi! I’m Rani and I’m the Preschool Director at New Hope. Born and raised in New York, I received a dual Master’s degree from Adelphi University in Early Childhood Special Education. I work as a New York City public school teacher and live with my husband and two kids in Queens. My heart has always been drawn to working with children and always had a soft spot especially for those with disabilities. Teaching little ones is my dream job because they are just so funny and it’s so much fun watching as their little minds work and grow. I really enjoy the diversity of New Hope and truly feel that we are serving the Kingdom by serving the community. Hey, my name is Param and I’m a Pastoral Apprentice at New Hope. I was born and raised in Minnesota into a Nepali family who were culturally Hindu and Buddhist. I was introduced to the Christian faith at New Hope when I was a freshman studying at St. John’s University. I fell in love with Jesus through being discipled, reading the scriptures, and spending time in community at New Hope. I currently work for a risk finance firm and go to school at Reformed Theological Seminary. My hobbies include running, reading, and hiking!